Ken Dychtwald, author, Ph.D., CEO, and general force of nature, walked into my office. “Jay,” he said, there are a few stories I’d like to work on today. But this first one is a gift for you.” A gift indeed. In his career, Ken has spoken to millions of people – and when Ken wants to talk, I listen. 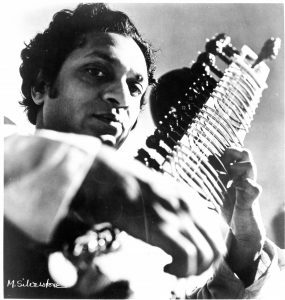 “I was working at Esalen Institute in Big Sur in the early ’70s,” he says, when he heard that Ravi Shankar, the great sitar player and teacher of the Beatles, was playing nearby. So Ken and some friends piled in a VW bus and headed to the Berkeley Student Center for the show. “I’m sitting in lotus position,” Ken went on, getting a kick out of his younger self, feather earring, long hair, yogi persona. He scans the venue, taking in the room full of hipsters and beautiful women. “Soon, Ravi comes on stage. He starts tuning his sitar.” Five minutes later he was still tuning his sitar. “We’re waiting and waiting, and he tunes for ten minutes, and he tunes for 15 minutes.” Ravi tuned for 30 minutes, and at this point, as Ken says, “everyone has come back to earth,” (so to speak.) And then, finally, Ravi played a most amazing show. And then, a few weeks later, Ravi came to Esalen, and he played another fantastic show that Ken attends. Afterwards, a few of them are having dinner. “What do you mean?” Ken asked. I thought a lot about this story a lot in the days that followed. Because as presenters, we don’t have a guitar, or a sitar. We have our voice, and we have our audience. And that’s what we need to tune. We listen. We’re patient. We hold our story until the time is right. Whether it’s a one minute story or a ten minute story, we bring the audience into the story, drawing on the suspense, sensing when they are in the story with us. Not overwhelming them with data, because if we do, we’ll lose them to thoughts of email and meetings. We listen for responses, slowing when we have the audience in our hands, and even skipping over some extra stops in the story if it seems it’s time to get to the punch. Our stories take them on the journey, holding key message to land just when we get there. And delivered well, that message is truly digested, and retold again with the story to carry it. Delivered well, that story may be passed on through the days and the decades, just like the Ravi story that Ken told me on the day that I received a very nice gift.